Just as we live and operate in a community of people, we are also a part of the natural world. We value this natural environment and its life-sustaining properties on many levels and for any reasons. At the same time, we are also acutely aware that we are a business in an industry not know for its environmental responsibility. Fortunately, we can do something about that, and operate in as sustainable a manner as possible given present knowledge and technology. Since internal combustion engined automobiles are a fact of life for the time being, and servicing them is our business, how do we square this reality with our desire to minimize our negative environmental impact? We pay attention and do our best to do the right thing at every opportunity. What does this look like on a daily basis? It’s a combination of small and large changes and procedures, both industry-specific and generally applicable, that, in toto, make a significant difference. Internal combustion engines are lubricated with oil that needs to be periodically changed. After use, that oil then enters the waste stream, where, like all unwanted and no longer useful matter, it must be dealt with and disposed of. This oil is re-recycled for reuse in lower tolerance applications. Of course, the high quality fresh European oil that we put into our clients’ cars is obtained in bulk, reducing container waste. Worn car parts that have been removed from clients’ vehicles are another class of waste that we must deal with. Fortunately, some of them are metal that can be easily recycled, so we do. When we acquired our building and relocated to our present location in 2004 in PGE’s service area from Pacific Power’s, we requested that our electricity be from 100% renewable power. Their response was that the reason I had it at my house was that it was only available for residential customers, that there was no such program for businesses. Our response, “You know you’re going to have a renewable power program for businesses someday, so why don’t you tell the higher-ups that there’s someone on Powell Boulevard that wants it now. Put it together and we’ll be your first client.” Six weeks later the documents to sign up for the program were on our fax machine. That was over 14 years ago, and we’re proud of our leadership in this area and that Portland General Electric finally launched a renewable energy program for local businesses as a result. As anyone that has ever ordered anything from Amazon knows, containers and packing material have become an issue in the waste stream. We pay to have a special dumpster exclusively for cardboard that is filled with these boxes and shipped off for recycling. Automobile batteries are shipped back to the manufacturer, where the carcasses are cleaned and remanufactured. Coolant, also known as antifreeze, is also remanufactured and resold by the recycler as “Green Coolant”. Unfortunately, as with the recycled motor oil, it does not meet our rigorous standards here at Pacific Motorsports, so we are unable to use it ourselves. Old car tires, which are a major waste problem, are hauled away by a specialty tire recycler, who grinds them up to be used for rubber playground surfaces, asphalt repair modifiers, civil engineering applications and other appropriate uses. 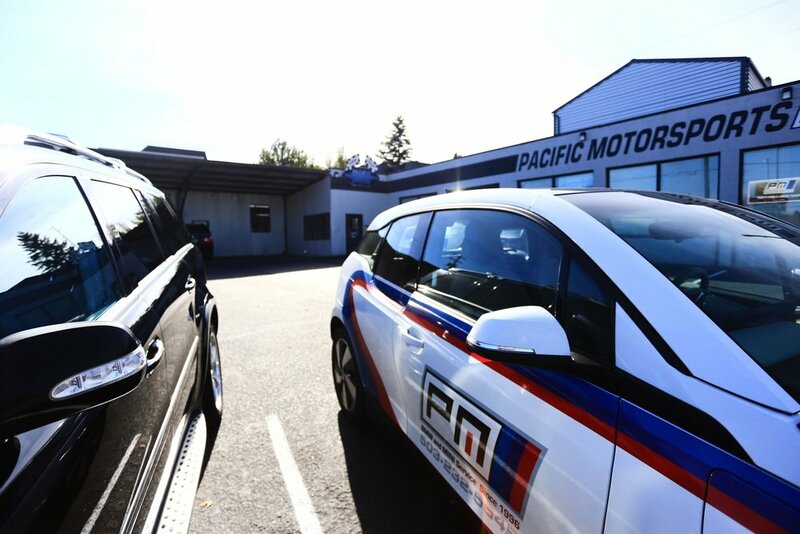 While recycling is good, and we do as much of it as possible here at Pacific Motorsports, reducing our energy usage is also part of our environmental commitment. To that end we retrofitted our entire building, inside and out, with LED lighting. This project was engineered in conjunction with the Energy Trust of Oregon and has meaningfully reduced our electrical usage. Since a company vehicle is necessary for us in our daily activities, like giving rides to clients and getting parts, we obtained an electric vehicle for this purpose when BMW first released the i3. We have successfully employed this electric car for over four years and 25,000 miles so far, and it is charged with renewable power. 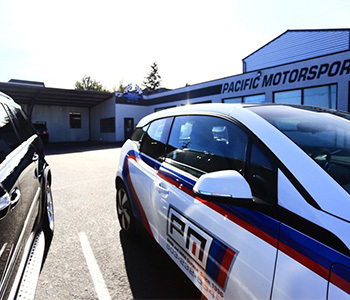 Whether its small things, like the weekly recycling of our office paper, or bigger moves, like reduced energy consumption, we endeavor to be good environmental stewards in everything we do at Pacific Motorsports. It may not be the easiest thing to do, but it’s the right thing.